Noise-induced hearing loss (NIHL) may not be the first hazard that comes to mind when thinking about construction site hazards, but studies have shown that the construction industry accounts for the second highest number of workers being affected by hearing impairment. This damage happens so gradually that victims may not even realize anything is wrong until past the point of no return. On the other hand, a one-time exposure to a sudden powerful noise, such as an explosion, may damage your hearing instantly. Either way this hearing loss is permanent and it cannot be corrected with surgery or hearing aids. For this reason, it’s absolutely crucial that you be proactive about preserving the sensitive nerves in the ear. 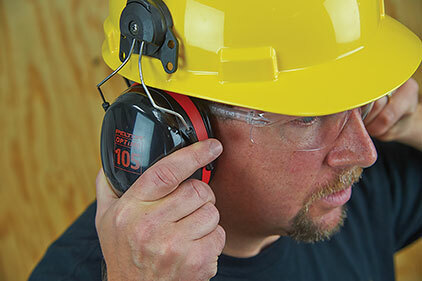 Industrial-grade hearing protection like earplugs or earmuffs should be worn at all times when working on noisy construction sites. Safety and health inspectors should measure sound or noise levels using a device called a sound level meter. A microphone on the device is positioned at the user’s ear level. Equipment that is determined to be loud can be labeled with a hazardous noise sticker. The Occupational Safety Health Administration (OSHA) uses noise dosimeters to document the average noise exposure over your working day or of a particular task for part of your workday. OSHA recommends that workplace noise levels be kept below 85 decibels (or dBA) per 8-hour time-weighted average. As the noise level increases, it damages your hearing at a much quicker pace. When noise is as loud as 100 dBA like a jackhammer, it can take exposures of as little as 1 hour per day to damage your hearing. When a sound level meter is not available, workers are encouraged to use the 2-to-3 foot rule: Stand about an arm’s length away from your coworker. If you have to raise your voice to be heard 2-3 feet away, you should assume that the sound level is at or above 85 dBA. One of the best ways to reduce exposure to hazardous noise on a work site is by planning for potential exposure before a project starts. There are multiple ways to reduce your exposure other than only hearing protectors. For instance, an employer or supervisor can buy materials to build sound barriers or schedule noisy activities during hours when fewer people are working. An employer can also rent or buy quieter equipment. They employer should hold frequent safety meetings to discuss ways to limit high noise levels and other hazards. During safety meetings, the general contractor can ask subcontractors to describe the planned tasks for the day or week where hazardous noise might be generated, as well as what equipment will be used so that teams can discuss opportunities to limit dangerous exposure. At Frontier Industrial Corp. we put the safety of our employees first by encouraging all FIC team members to understand how to use the proper personal safety equipment to ensure they are being safe while on the job site.